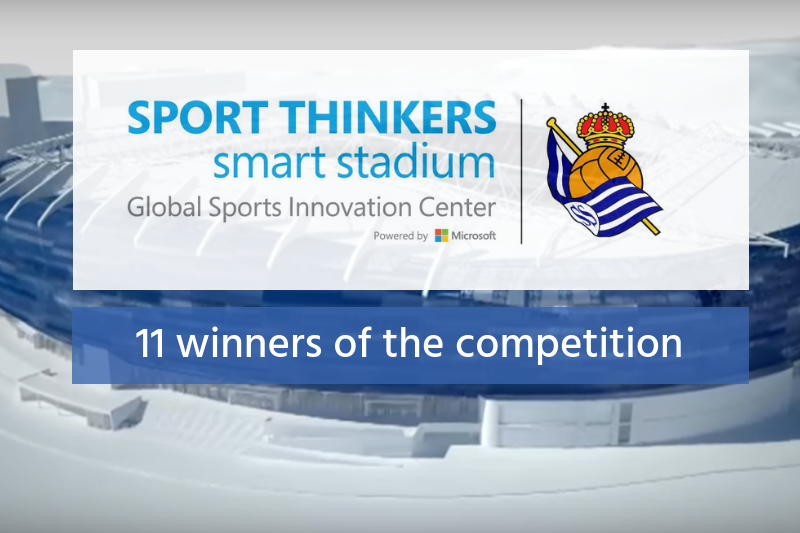 The first part of the final phase of the Sport Thinkers Smart Stadium competition that was organized by the Global Sports Innovation Center powered by Microsoft (GSIC) in collaboration with the Real Sociedad S.A.D. and Microsoft, took place on October 8, 9 and 10. This competition for technology-based companies aims to carry out actions that will support the digital transformation of the Anoeta stadium that is currently under reconstruction. Iris Córdoba, the General Manager of the GSIC said that “We are very satisfied with the whole process of the call. It gave us the opportunity to meet more than 80 innovative companies that are developing solutions and services to support entities such as the Real Sociedad in its digital transformation processes. Now, 11 of them have the possibility of bringing their disruptive technologies in the Anoeta. 6 out 11 winning companies are already members at the GSIC, and the rest will also join our ecosystem, to enjoy the benefits offered by the center. In addition, all winners will begin the acceleration program designed by the GSIC. They all will be advised by our Sport Thinkers mentors network composed by the best sports industry professionals”. Juan Iraola, responsible for the Digital Area at the Real Sociedad, also shares the positive feedback on the process started together with the GSIC and Microsoft. “From the beginning, the program created by the GSIC with the name of Sport Thinkers Hub seemed attractive to us because it offers a new way of bringing the innovation to a club like Real Sociedad. An innovation based on technological solutions that will allow us to deepen the digital transformation project started in January 2016. Thanks to this program, we have achieved 11 technological proposals that will provide us with new solutions in different aspects related to the stadium: new ways of interacting with our followers, systems to control energy consumption, solutions for the maintenance of facilities, management of new VIP areas, content generation, etc. I find it difficult to find an alternative to this format, Sport Thinkers Hub, that allowed me to learn, acquire and implement innovation in a company that does not have the resources of knowledge and experience in such a changing and demanding environment as technology,” says Juan Iraola. Batura Mobile Solutions (Spain) – It is a technological solution that encompasses services and needs related to accessibility requirements for disabled supporters. The objective of this mobile solution is to allow an APP to exist for all people with no exclusion, where the experience of football and the stadium are lived in an integrated manner. It consists of the development of a specific module with different functionalities to be implemented in the Mobile APP Realzale or in any existing or future App. Brintia (Spain) – They offer a cost effective, scalable, real time ChatBot solution to help solve and optimize common customer service issues for sports entities. Applying Microsoft technologies and AI, we can build a customized ChatBot that can be used as a real time automated Customer Service Platform to answer all of your fan’s FAQs, make ticket & merchandising purchases, and give a personalized experience for subscribers and club members; 24/7, in multiple languages and at no extra cost for out-of-office hours. Cinfo (Spain) – Their products offer a one stop solution recording and broadcasting in real time over any platform, with a system of fixed and mobile cameras to cover different angles. Cinfo’s fixed cameras are suitable for indoor and outdoor use. Their cloud video technology, able of generating video in real time as if each event was a videogame, combined with our AI algorithms, offers a range of differential solutions in quality and price. Deep Data (Spain) – Company specialized in energy management software and IoT applications for Smart Cities & Buildings. They have a complete software that can integrate in the same tool the comprehensive energy management of facilities (electricity, air conditioning, water, production processes, etc. ), energy contracts, renewable energy, personnel and access control, smart parking, interior lighting, exterior and shows, waste, lawn water, wifi networks. Iristrace (Spain) – They have a simple tool to create checklists and audits, with complex processes in order to validate data and get data into the systems directly from the frontline staff. We avoid many hours in reporting and checking the job done. iXpole (Belgium) – iXpole is a cloud-based solution helping professional sports clubs professionalize their internal business processes. iXpole centralizes all data related to the club’s B2B customers (like contract management, hospitality, sponsorship, ticketing) in one tool, allowing each internal user to have access anywhere, anytime to the most up-to-date information about his customer. No more lists, phone calls or emails to get things done. A club can grant each B2B customer access to the same information through his very own personalized VIP Portal where he can plan the match experience (print/assign tickets, order menu’s, order extra’s) but also create order forms or consult e-invoices. NFCSound (Netherlands) – They use the sound as a technology protocol to send data. Can be used for fans engagement, sponsorship, advertising, information, gamification, ticketing and check-in, security. Difference and uniqueness: we are the 1st (or 2nd) company in the world who can engage offline through radio and TV. There is no need for hardware deployment, since the stadium already have a sound system. They turn those speakers into a data broadcasting tool. The fans are going to decode the data through the microphone of their smartphones, a peer-to-peer communication without going through servers, means there is never delay, congestion or buffering. Pressenger (Hungary) – Their solution allows sports mobile apps to send data-driven animated push notification bubbles directly to the users´ screen. The Pressenger notification bubble is the most engaging mobile communication tool, that is also a brand-new platform for sport clubs and sponsors to market in a direct and interactive way. Yarr TV (Spain) – It is a social media marketing platform that helps events, businesses and brands to take full advantage of the content generated by the user. Its objective is to boost the experience and commitment of the fans, using solutions of social competitions and surveys on the stadium screens. Yerba Buena VR (United States) – YBVR is a technological platform that drives video experiences in virtual reality. The company offers the transmission of premium VR video to solve the problem of low quality perceived by the user with other solutions in the market. They perform live broadcasts of sporting events, where the user can enjoy the experience of a game being outside the stadium. The last stage of the competition will take place from November 4 to 7 in San Sebastian, where all the winners are invited for the immersion week with the club. During these days, the companies will be able to meet in person the directors of Real Sociedad, to learn how the club functions internally, what are the technological its needs and how they can customize their projects for the Anoeta Stadium. This activity aims to detect the possibilities that exist for these companies to implement a pilot in the renovated Real Sociedad stadium.